It’s early January and I’m sitting in the Green Dragon pub at Sustainable Bungay’s first event of the year, a Green Drinks session on the theme of Well-Being and the Community. The room is packed, the discussion is lively, and a new Arts, Culture and Well-Being group is formed with monthly events already being planned and put into diaries. Everything from mapping the areas in town where people experience well-being (or not), to teaching each other skills in communications, living together, growing food, meditation and even body drumming (I’m going to have a go at that one). This post is not (for once) just about Sustainable Bungay (“You don’t really need to speak about us this time Mark,” laughed Josiah on the phone the other day. “We’ve been very well represented, after all!”). I did want to mention that meeting though, because of the connections I perceive between the local initiative I’m in and what people are saying and hinting at in their pieces for this week on other Transition initiatives in East Anglia. The two main things I notice at this point five years down the Transition line are: one, a strong feeling that we actually have been building community over this time with all our meetings and events and discussions. People really wanted to be in the pub looking at ways, often quite simple ways, to maintain well-being, and hence resilience, by doing things together. This is reflected in Carol Hunter's piece (this coming Thursday) about Downham and Villages in Transition in west Norfolk. The other is an awareness of how many people are in our lives who weren’t there before Transition began. And how diverse we all are. Even in a rural market town like Bungay (sorry, I’ll try not to say it again) where the population is less obviously diverse than in a city, say, our transition group has (and welcomes) a large variety of people. Everyone was aware it couldn’t be done on our own. And even within the group itself, there is a greater awareness of the challenges we face both locally and globally, certainly in terms of financial and climate instability, than there was in the early days. East Anglia has hosted three Transition in the East gatherings since 2009, in Downham Market and Diss (Norfolk) and East Bergholt on the Suffolk-Essex border, as well as a large Transition Suffolk meeting in 2011. The Diss gathering in November 2009 coincided with the publication of a document “Transition in the East: co-operation, collaboration, support and influence” produced by Charlotte Du Cann and Josiah Meldrum and based on telephone communications with twenty nine initiatives over the course of several weeks. These events catalysed vital discussions and were key in forming and strengthening the transition networks in Suffolk, Norfolk, Essex and Cambridgeshire. Many of the people and groups involved are still in touch with each other within the region. We often attend each other's events to share experience and best practice. And sometimes to give each other a boost. In November a quartet of us set off from a previously mentioned Transition Initiaitve in north-east Suffolk to see the folks at the recently revived Sustainable Bury at Bury St. Edmunds Green Fair. This was in exchange for the visits to B**G*Y from Karen Cannard of The Rubbish Diet fame, who had come to talk all things bin-slimming at our Give and Take Day in September and led a Green Drinks session earlier in the year on domestic waste. See Karen Cannard's blogpost on how these exchanges provide fertile cross-pollination. Sustainable Bury is not the only initiative to re-emerge. Transition Woodbridge has recently started to organise again following the collapse of the original group. Wivenhoe, a university town of 10,000 people on the River Colne in north Essex, is home to Transition Town Wivenhoe, now over four years old. The initiative recently celebrated the New Year with a cycle-powered showing of the film Chasing Ice, a climate change documentary about photographer James Balog's Extreme Ice Survey, which recorded Arctic ice melt over a period of three years. I bumped into an acquaintance the other day I hadn't seen for ages and started talking to her about Transition, had she heard of it? "Oh yes," she said, "I'm part of GreenerSax's foodgrowing group" (in Saxmundham, Suffolk). Nearby GreenerFram in Framlingham have just published their report on last year's Suffolk pilot of Transition Streets, based in and around the village of Cransford and have set up a meeting to take it further. And Stowmarket Transition formed last summer, recently appearing in the local paper talking about their "new "green project" aimed at reducing the town's carbon use. As I said on the front page introduction to this East Anglia in Transition week, this post is the tip of the iceberg as far as Transition activity in this region is concerned. I haven't mentioned Transition Norwich, for example, whose original food group turned into the CSA Norwich FarmShare, now in its third year, and whose NR3 neighbourhood group created the annual Magdalen-Augustine Festival in one of the city's so-called deprived areas. 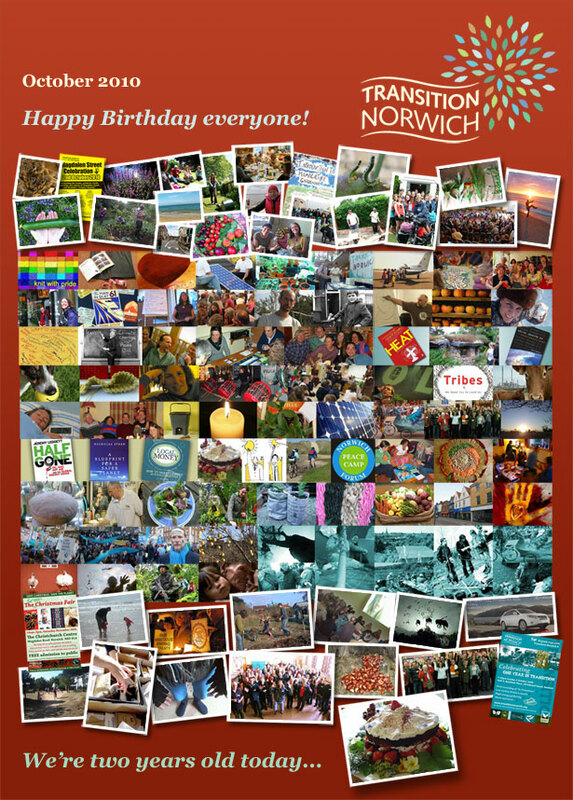 The Transition Norwich blog, This Low Carbon Life, was the inspiration and model for this very Social Reporting project you are now reading. 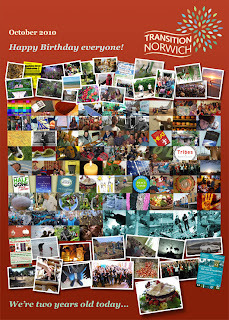 The voices of Norwich transitioners and guests are there to be read and enjoyed in the more than a thousand posts on the blog since its inception in October 2009. That's an archive if ever there was one! If you are reading this and are part of a Transition initiative in East Anglia, do feel free to make yourself known in the comments box below and put a link to your website or Facebook page. And if you'd like to join the Transition Circle East community blog and upload posts about your transition group and events, email Charlotte at theseakaleproject@hotmail.co.uk for an invitation. And me, I'll be getting on with helping to organise our new Arts, Culture and Well-Being group in SssshYouKnowWhere. And reporting on our activities here on the Social Reporting project and elsewhere throughout the year. Though talking of icebergs, I might not actually be able to get to Happy Mondays tonight for the South Indian themed meal. Bah!